Originally intended to monitor the moisture in a potted plant, this moisture monitor really shines as a Christmas tree stand water level monitor! I've used this for decades now, and it's the first thing I hook up once the tree is in the stand. A fresh Christmas tree drinks water an annoying rate and bending down under the decoration-laden branches to check the water level is a pain in the neck (or back). But if the tree isn't kept moist, it will cease to take up water and quickly dry out. This moisture monitor uses two lamps to indicate whether the water level is okay or low. The circuit uses AC current to test conductivity to reduce electrically-induced corrosion. Power is supplied by an ordinary 12 VAC molded transformer (not DC!) capable of supplying enough current to light the lamps. 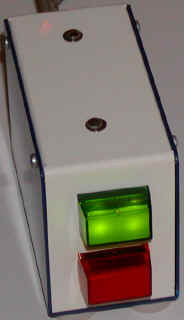 The SCRs should be sensitive-gate types also with a current rating higher than the lamps require. The prototype uses metal can SCRs but the ordinary 2N5064 or similar will work fine. 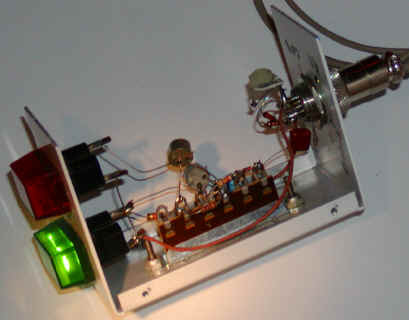 The prototype's lamps consume 60 mA each (two per holder). For potted plants use two stainless-steel nails as probes. Tin the heads of the nails using plumber's flux or stainless steel flux but wash the tinned nails with detergent and water before connecting the copper wires. Cover the connections with epoxy to protect the copper wires. One technique is to cover the solder connection with heat shrink with a drop or two of epoxy inside. Upon shrinking the tubing, the epoxy oozes out each end making a rugged and waterproof seal. For a plastic Christmas tree stand, connect the alligator clips to two of the screws in the stand that hold the trunk. This technique will only work if the body of the stand is plastic (non-conducting) and the ends of the screws have plastic tips to prevent penetration of the tree trunk. If your stand is metal you can use the stand as one electrode and suspend the other electrode over the water from an insulator fastened to the tree trunk or edge of the stand. Another nice accessory is a funnel (painted green) hidden in the branches with a tube running down to the stand. Secure the end of the tube below the surface of the water to prevent splashing. No bending down is required at all!